There's only two weeks until ANPC's National conference in Canberra 29 - 2nd Nov. The full program is now available and includes a range of interesting presentations, workshops and posters on the theme of Plant Conservation in Australia: Achievements and Future Directions. For more information including registration details visit the conference webpage. The Australian Network for Plant Conservation is hosting a workshop on Seed collection, storage and use for native vegetation restoration 5 November 2012 at the Australian Botanic Garden, Mount Annan NSW. This workshop will provide participants with the knowledge needed to effectively collect, store and use seed in native vegetation restoration. Experts in the use of native seed will present a selection of case studies. For more information, including a full program, flyer and registration form please visit the workshop webpage. This workshop will also be held in SE Queensland 3rd April 2013. Registrations to open December 2012. 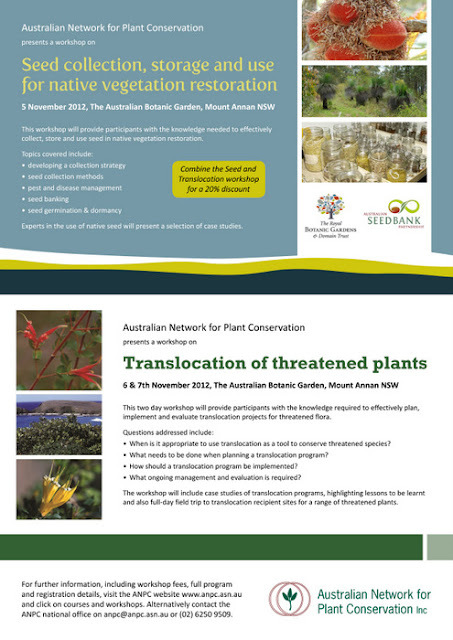 The ANPC will be hosting its next Translocation of Threatened Plants workshop 6 - 7 November 2012 at The Australian Botanic Garden, Mount Annan NSW. This two day workshop will provide participants with the knowledge required to effectively plan, implement and evaluate translocation projects for threatened flora. When is it appropriate to use translocation as a tool to conserve threatened species? What needs to be done when planning a translocation program? How should a translocation program be implemented? What ongoing management and evaluation is required? The workshop will include case studies of translocation programs, highlighting lessons to be learnt and an optional full-day field trip to translocation recipient sites for a range of threatened plants. 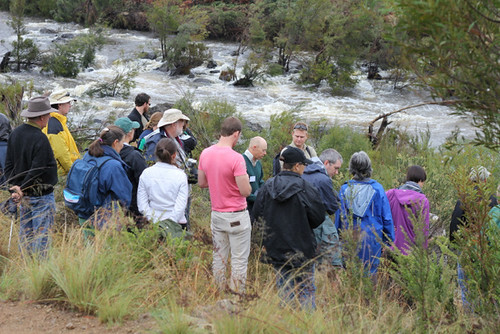 Workshop participants viewing a translocation recipient site for the the endangered shrub Muehlenbeckia tuggeranong during a previous ANPC Translocation workshop. For more information, including a full program, flyer and registration form please visit the workshop webpage. You can also read a report on a recent translocation workshop and view images here. This workshop will also be held in SE Queensland 4-5 April 2013. Registrations to open December 2012. 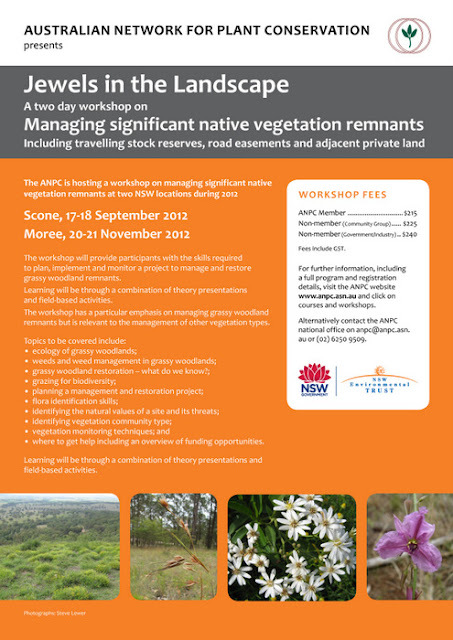 The ANPC is hosting it's final workshop in the Jewels in the Landscape series 20 - 21 November 2012, Moree NSW. This two day workshop will provide participants with the skills required to plan, implement and monitor a project to manage and restore significant native vegetation remnants. Images of past Jewels in the Landscape workshops can be found at ANPC's workshop flickr pages. The Australian Network for Plant Conservation has embraced social media in our efforts to promote and develop plant conservation. You’ll now find us sharing plant conservation news on Facebook, Twitter, and Google +. We’re also sharing images from current and past ANPC activities on Flickr. We’ll continue to send out a summary of major news every 3-4 weeks via the ANPC News email newsletter. If you have plant conservation news you would like us to share please email your news to anpc@anpc.asn.au. Please include "For ANPC News" in the subject. Nice overview on why we should care about Biodiversity. 'What is biodiversity and why does it matter? NSW NEWS: New organisation Local Land Services (LLS) created by merging NRM and Ag services from LHPAs, CMAs and parts DPI. Free e book - Glimpses into disappearing landscapes: Nationally Listed Threatened Ecological Communities of the South West Region of SW WA. Wondered what a regional Seedbank does and achieves? Check out this nice video about Murray CMAs Seedbank. Three rare insects to be translocated onto three three critically endangered plants in the Stirling Ranges, Western Australia. Victoria's Native Vegetation Management Framework is being reviewed. Opportunity to comment close 19 Oct.
Australian Aila Keto honored yesterday by @IUCN at #IUCN2012 for 'outstanding services to conservation'. The Habitat Network has started a new community native plant nursery and food garden – “The Habitat” at Santa Rosa Park, Quarry Road, Ryde. All volunteers welcome. The first recipient of the David Given Award for Excellence in Plant Conservation has been announced: Stewart McPherson. The David Given Award for Excellence in Plant Conservation aims to enhance the profile of plant conservation and encourage outstanding efforts of young plant conservation professionals. This award is named after the late Dr. David Given to honour his outstanding contributions to SSC and more broadly to plant conservation. Leading Australian environmental scientists have helped to establish the first global list of threatened ecosystems at an international conservation summit. This momentous advance in global conservation – creation of a ‘Red List’ for whole ecosystems rather than just threatened species – was adopted by the 2012 IUCN World Conservation Congress held in South Korea September 6-15. The Government recently announced major changes to the governance and structural framework of agricultural and natural resource management services and functions in NSW. From January 2014, Local Land Services will deliver functions currently provided by 13 Catchment Management Authorities (CMAs) and 14 Livestock Health & Pest Authorities (LHPAs) and agriculture advisory services of Agriculture NSW (part of the Department of Primary Industries). According to the Government, Local Land Services is intended to be a new customer-focused way of delivering Government-funded agriculture and natural resource management services, advice and information in NSW. · emergency and disaster assessment and response. The new Local Land Services will become operational in January 2014, when they take over the functions of CMAs, LHPAs and DPI as outlined above. In the interim, landowners will still be able to access existing services from these organisations. During this time a range of transitional arrangements are in place, including CMAs will be reduced from 13 to 11. Bringing together expertise from across Australia, The Australian Seedbank Partnership recently announced the 1000 Species Project. The project will be collecting and storing seed from native plant species valued for their endemic, endangered or economic significance. 1000 species not currently secured in Australia’s conservation seed banks will be targeted. The South Australian Seed Conservation Centre has developed an online resource about seeds of South Australia. The Census of the Vascular Plants, Hornworts, Liverworts and Slime Moulds of the Australian Capital Territory lists the scientific names of the native and naturalised vascular plants, hornworts, liverworts and slime moulds known to occur in the Australian Capital Territory. All records are based on herbarium specimens housed in the Australian National Herbarium. In many parts of Australia, there is increasing pressure on groundwater resources from activities including agriculture, mining, urban and commercial developments. While groundwater dependent ecosystems are vulnerable to such pressures, there is a knowledge gap in understanding how they should be managed. The Groundwater Dependent Ecosystems Atlas aims to address the knowledge gap by creating the most complete inventory of the location and characteristics of groundwater dependent ecosystems in Australia. provide a central, web-based portal to present the information. Here's a selection of recent research articles related to plant conservation. Developing biodiverse plantings suitable for changing climatic conditions 1: Underpinning scientific methods, by Booth and Williams, Ecological Management and Restoration. Developing biodiverse plantings suitable for changing climatic conditions 2: Using the Atlas of Living Australia, by Booth, Williams and Belbin, Ecological Management and Restoration. Does managed coastal realignment create saltmarshes with ‘equivalent biological characteristics’ to natural reference sites? by Mossman, Davy and Grant, Journal of Applied Ecology. Long-term stock grazing management in Travelling Stock Reserves and influence on conservation values. by Spooner and Morris, Ecological Management and Restoration. Grants are available for establishing and funding biobank sites on public land. Expressions of interest (EOIs) are being sought from public land managers in the Sydney Basin. Plant diversity has never been more important than now. It offers solutions towards food security and sustainable livelihoods, and yet we continue to destroy species at an accelerating pace. What are strategies to preserve plant biodiversity? Listen to Stephen Hopper's 2012 Menzies Memorial Lecture – From Botany Bay to Breathing planet: reflections on plant diversity and global sustainability. The 2012 Nature Conservation Council of NSW Annual Conference will be held at the University of Sydney Law Foyer on 27-28 October 2012, including the presentation ceremony for the NSW Environment Awards. The NCC Annual Conference is an opportunity for member groups to gather from across the state and formulate council policy. Further details here. Please note registration closes today. The NSW Roadside Environment Committee (REC) is hosting a state-wide forum on linear reserve environmental management to showcase examples of best practice and to facilitate discussion that helps land managers in both linear reserve planning and operations. Cost is free (but places are limited). The Greening Australia Moolapio Grassland Discovery Day will showcase the Moolapio Grassland and Seed Production Area. For more information and to register (COB Friday November 2nd) email Lyn Willcock at lwillcock(at)gavic(dot)org(dot)au. The inaugural Society for Ecological Restoration Australasia Conference, 28-30 November 2012 in Perth, Western Australia is shaping up to being an exciting and inspiring meeting with seven keynote speakers now announced. The symposium sessions have been announced and include an ANPC symposium on the role of plant translocations in restoring and maintaining biodiversity: policy, planning and practice. The symposium will include presentations by practitioners from across Australasia exploring the current and future role of threatened flora translocation in restoring and maintaining biodiversity. Issues to be discussed include: the role of translocation as a climate change adaptation tool, the importance of information sharing and guidelines, and lessons learnt from past translocation projects.